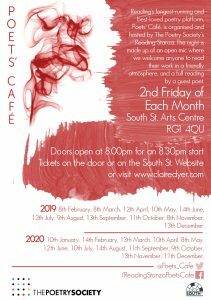 Reading’s longest-running and best-loved poetry platform, Poets’ Café, is organised and hosted by The Poetry Society’s Reading Stanza. Doors open at 8 pm, poetry starts at 8.30 pm, the evening is scheduled to end at 10.30 pm. If you wish to sign up to our GDPR friendly mailing list, you can do so HERE. If you are interested in joining our Stanza please let me know. More information can be found HERE. Any personal data collected and recorded by Poets’ Café will be used fairly, stored safely and securely and not disclosed to any third party unlawfully.